MP Vypam Jail Prahari Recruitment 2018 Notification released on 3rd August 2018. Vacancy for Madhya Pradesh PEB has not been released, however. Candidates fulfilling the minimum educational qualification and physical eligibility criteria can apply for the post for this Latest MPPEB Jail Prahari Recruitment. Detailed advertisement notification has not been released yet. Therefore, after releasing the MP Vyapam Jail Warder Vacancy Advertisement, you can download the Notification in PDF format and get detailed eligibility criteria for the post. Furthermore, check other aspects of the exam like Minimum Eligibility Criteria, Application Form/Applying Online Link, Salary Scale for Jail Prahari Exam etc. << Download Solved MP Jail Prahari Previous Years Question Paper Download. Official website to fill up application form peb.mp.gov.in. MP Vyapam Jail Warder posts recruitment notification has been advertised for which candidates can fill up the online application form. We have given detailed educational eligibility criteria, minimum physical requirement including height, weight, chest for male and female candidates separately. Vacancy break up of SC ST OBC General candidates available on peb.mp.gov.in. The detailed advertisement notification can be downloaded from the link given below. However, the Examination Board has only released the short notification. We will share in this page the link to download detailed advertisement in PDF format. 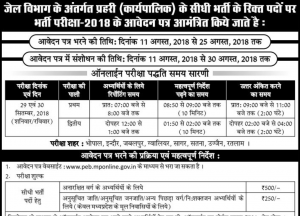 Madhya Pradesh professional examination board (MPPEB) will conduct the recruitment of posts advertised in the latest notice in 2018. The number of Jail Warder or Jail Guard vacancy 2018 which is to be recruited is still unrevealed. Earlier, the authority issued recruitment notification for 2362 vacancy combined for Forest Guard & Jail Prahari. There was a combined recruitment test conducted by the MP PEB. The number of Jail Warder/Prahari Vacancy is not available right now. Hopefully, the number of posts to be recruited will be on a higher side. The MP Jail Prahari Vacancy will also be reserved for SC ST OBC category candidates. Candidates of other states may also apply for the posts of MP Forest Guard online @ peb.mponline.gov.in. Click to see – MP Vyapam Forest Guard Jail Prahari Admit Card Download & Exam Date. For detailed post wise/ region wise vacancy break up, download the advertisement notification from the link given below in the posts in PDF format. Vacancy may also be reserved for Ex serviceman (ESM) and Physically Disabled (PH). Jail Warden Minimum Education Eligibility Criteria – One must complete their Higher Secondary or 12th pass in 10+2 System to appear in the exam. The candidates must have passed higher secondary (HS) from any recognized education board. For female candidates, there is no requirement of Chest and chest expansion (सीना). For some special category candidates, relaxation in height/ chest will be provided. Kindly check the list from the recruitment notification advertisement for MP Vyapam VanRakshak posts. Walking test or Paidal Chal. << MPPEB Jail Warder Exam Cut Off Marks of earlier years. Merit list will be decided on the basis of marks obtained in the written test only but candidates have to pass in all the tests. Medical and document verification (interview/viva) will be there for Forest Guard recruitment in 2018 by MPPEB. Madhya Pradesh Vyapam website has also stated that the recruited candidates will have to undergo a training period for some days. Age relaxation will be provided to candidates belonging to SC ST OBC Ex-serviceman category. Unreserved Category – Rs 500 + Other charges. Reserved category – Rs 250 + other charges & fees. Pay scale – 5,400 – 20,200 Rs basic pay scale. Grade Pay – Rs 1900. Recruited Jailguards will be paid other allowances also which will be included in their monthly salary. This was the pay scale including the grade pay only. Visit the official website of MP Vyapam link of which is given below. Other guidelines and instruction can be downloaded from the links given here only. 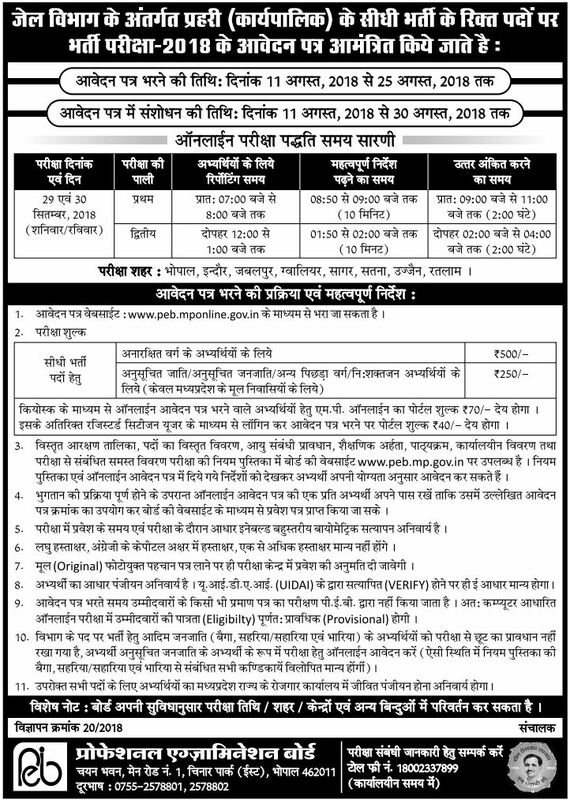 Madhya Pradesh Professional Examination Board (MPPEB) official authority will release the advertisement notification first consisting of full details. In this notification with advertisement no, they will tell the dates from which online application form will be available. After the starting date of application form receiving, candidates will be able to submit their form on MP PEB online website. Next, click on the direct link to apply online. Enter all the required details and verify the entered data. If all the things are correct then click on submit button. When you are done, just print the application form and keep a copy with you. Download Recruitment Notification – Click here. Notification advertisement for 1400 forest guard posts: click here (OLD). For further details, visit the official portal and check our website www.jobsandhan.com to get latest recruitment notification. We will publish more details about the recruitment when Madhya Pradesh Vyapam Detailed Jail Prahari Detailed Notification 2018 will be released. age limit for other state candidate is also 30 for the post of forest guard. pls do reply as soon as possible. Come on a job govt. Plz m compite gregveshn in job Govt. Other state age limit kitni h sir pls sey somthing. last date for MP Forest Guard application is given in the post. Kindly read carefully. Sir please reply age for female candidates for forest guard is 30 only and upto which month.. .
Sir please reply age for female candidates for forest guard is 30 only.aur 30years kis month Tak mangi had.. ..
please can u tell me whether I can fill the form or not as I will be of 18 years on 1 july 2017. oleas tell me faster than fater cause tomorrow is the last date to fill form. Written k bad PST hoga.